AVM-2000 Upgrade Version 6 is fully compatible with Windows® XP SP2, Windows® Vista and Windows® 7. Any users who have not yet upgraded to Version 6 should contact TangoWare about upgrading. Please note that Version 6 is considered a major upgrade. Version 6 of the AVM-2000 software has been completely re-programmed for Microsoft Windows VISTA-compatibility, but is still compatible with Windows XP-SP2. Version 6 of the AVM-2000 will also run on the Windows 7 and Windows 8 operating systems. Users upgrading from Versions 4 or 5 must be aware of the multi-user workstation licensing protection in Version 6. Check with TangoWare to find out how many workstations your AVM-2000 is licensed for before upgrading from Version 4 or 5. The Version 6 Upgrade may be downloaded from the Download 6 web page. Notes: All prices subject to change without notice. Support services are not included in the cost of the upgrades. Any support services provided for upgrades or upgrade features may be charged additional under our Support Policies. All files provided by download from the internet. The new items listed below are included in the most recent upgrade. WO > Details 2 > Print Estimate Authorization - fixed intermittent error where CRS# did not always print. (Temporary work-around prior to update is to print the Authorization from the Tasks page once before printing from the Details 2 page). WO > Details > Manual Used > EDS - fixed intermittent error where the EDS button did not always pull the correct manual ID# document to match the ID# entered for the task. Reports > Invoices > 5 Special Financials - new report listing for Posted invoices with query options for Invoice date and/or Posted date with XLS export or printout choices. WO > Tasks and Details > Print > Shop & Customer printouts with pricing - fixed rounding error with part sell values with three decimal places. Sometimes the Parts Sell Total or Parts Profit Total was off by 1 cent. Print to File - NEW - For users with web-based email addresses that will not work inside AVM-2000, a new button for "MailTo:" has been added to the Print to File form (see below). This button opens your default email compose window as configured in your Windows operating system. This button will only work once an email address has been populated into the "Email To" field. While this does not have the same functionality as the built-in AVM-2000 email functions, it does save some steps and makes it easier to email Print to File created documents. WO > Tasks > Delete - fixed delete task issue introduced in version 6.51A_057 only. Admin > Global Config > Work Orders > 1 General > Other - new configuration option to allow each workstation to remember the WO > Tasks grid column order. Users can move columns and they will be remembered every time the WO > Tasks is opened on that workstation. WO > Tasks > Filter - new drop-down option allows users to filter the Tasks List to Open WOs only, OR to a specific Task Type. Admin > Global Config > Bookkeeping > 1 GL Setup > Main Accounts > P & L Reporting - Minor modifications to improve selecting a classification for a GL that is "Not Assigned"
WO > Other > Trade Ins - fixed button Security issue. 8130s > Update from WO - new configuration choice added for Block 3 to use a combination of the Work Order # and 8130 ID #, such as 18549(7726) where 18549 is the WO# and 7726 is the 8130 ID #. WO > Other > Trade Ins - added a column for WHS for users with the WareHouse function turned on. This will help store items to the correct Inventory entry and help prevent receipt of duplicate serial numbers. WO > Details 2 > Estimate Authorization Other $ field - New - Allows users to enter a negative value to account for a trade-in. Inventory > Other > Update Shelf Bin from Spreadsheet - New - Users may update shelf bin location fields for multiple SKU numbers simultaneously using a specifically formatted XLS file. WO > Tasks > Print > 10 - New - Print choice for WO Discrepancy List with 3 tasks per page. New field in Admin > Global Config > WO > 1 General > Printing > WO Shop Continuous Discrep 3/pp Form # to enter new form number. Admin > Utilities > Send to CTI - This function was updated to reflect TangoWare's new FTP service. It is HIGHLY recommended that all users complete this update!! Admin > Global > WO > 1 > Authorization Estimates > Mark all new tasks as active estimates checkbox - NEW - When this checkbox is marked, all new, copied, moved, template, create from quote tasks, etc. are marked as active estimates on the Details 2 page. WO > Tasks > Populate blank Estimate text for all tasks button - NEW - Copies WO > Text > Discrepancy text to the Details 2 > Estimate Authorization Detail Text field only when the Estimate Authorization Detail Text field is blank. Invoices > Cores & Other > Print > 1 - Fixed problem where WO Suffix only printed 2 of 3 characters. P&Es > Receive - Fixed an obscure "Open" error when receiving WO Requisition items back to a Work Order. EDS (Electronic Document Storage) Module - NEW - EDS buttons were added to the Main pages of Inventory, Customers, Vendors, Employees and P&Es. Existing buttons remain on the "Other" pages of these forms as well. WO > Tasks > Print > 10 Shop Continuous Barcode List - NEW - Printout with barcodes and descriptions for each task on a WO (up to 45 barcodes per page). Allows users to easily record labor or parts against any task without needing the original worksheet/teardown form. Invoices > Main - NEW - Allows entry of full 100% discount percentages. Note: This is only available on the Invoice Main page and is not available in the Customers > Account & Taxes screen. Documentation > Fixed Wing W&B - Fixed - Problem where some multi-page W&B printouts caused a non-recoverable error. Documentation > Rotary Wing W&B - Fixed - Problem where some multi-page W&B printouts caused a non-recoverable error. Reports > Inventory > 1 Detailed Query List > Main - NEW - On-screen warning now indicates if a query selection will issue restricted results that are not a full on-hand report. Reports > Inventory > 1 Detailed Query List > Main - XLS Export function modified so that subtotal entries can no longer skew XLS summary results. QOH, List and Cost fields are all zeroed out for any subtotal entries only. QOH summary for each subtotal entry is included in the description. Admin > Global > Documentation > Electronic Signatures - NEW - on-screen note warns that any SecUserID displayed in red text indicates that there is no match for that SecUserID found in the Security database. Please note that spaces, uppercase and lowercase letters all must match exactly. WO > Reqs > WHS - Modified - The behavior of the WHS dropdown was modified to update Description, Cost and List if the "Freeze/Protect" Quote Prices was not turned on; or if the "Freeze/Protect" Quote Prices was turned on, but the Req item did not originate from a Quote (Quote # field is blank for that Req item). Users are now given a notification message if choosing a new WHS goes out to look up new pricing. If the part number + WHS combination does not already exist in the Inventory database, no changes will be made to the Description, Cost or List under any circumstances. Reports > Inventory > 1 > History and Sold/Purch/Used - Fixed - problem with calendar date entries. This problem occurred in 6.50Z_005 only. WO > Equip > Edit - Fixed - problem where Edit function does not save WO Equip edits. This problem occurred in 6.50Z_005 only. Documentation > 8130s > 8130 Feb-2014 - NEW - main page of 8130s programmed to use the new 8130-3 revision dated February 2014. The second pagetab, 8130 Jun-2001 allows use and printing of "old" 8130s using the Jun-2001 Revision. Admin > Global Config > Inventory > 1 > Batches Transfer Type - NEW - configuration choice added to allow users to transfer an entire remaining quantity and keep the original SKU, or to transfer a portion of the remaining quantity by creating a new target SKU. Inventory > Batches > WHS Transfer - NEW - added function allowing users to transfer batches or portions of batches from one WHS to another WHS for the same part number. Entries > Packing Slips - NEW - Added EDS module functions. Entries > Packing Slips - NEW - When an item is added to a Packing Slip from the Pending list, a note is made in the Shop Comments of the Invoice, P&E or WO with the date and Packing Slip number. Entries > Packing Slips > Open button - Fixed - problem where Open button became disabled once a Packing Slip was marked Closed. Reports > POs & Expenses > 5 Line Item Status (batches only) - NEW - A new reporting module allows users with Batches in use to find out where all line items currently are, such as on a WO, Invoice or in-stock in Inventory. Printed report or Export to XLS options available. Reports > POs & Expenses > 5 Line Item Status (batches only) - New - Report added to allow users to see the "status" of Line Items. This report allows filtering by PO or P&E #, as well as filtering to specific statuses. Statuses include WO-Task #, Invoice #, Inventory and Unreceived. Report may be printed or exported to XLS. Note: This report will only work for users with the optional Batch Tracking module turned on. Entries > Packing Slips - Fixed - Problem with Print Direct to Default Printer option and problem with Open button being disabled when a Packing Slip was marked closed. Reports > WO > 1 List by Query - Fixed - Non-Recoverable Error (NRE) that was happening after the query was Run and user tried to close the pop-up Browse Results list. 8130s > Main > Print - NEW - two additional print choices increase the amount of Block 13 text that will print on the Portrait and Landscape 8130 printouts. Entries > ATC - Fixed - Intermittent Non-Recoverable Error (NRE) caused when using the Work Order choice in the Clock Type dropdown. P&Es > Order Items > Import from Spreadsheet - NEW - Function allows users to import line items into the Order Items grid using an XLS-format file. Detailed instructions on file format and requirements can be found in the Help files. Use the yellow question mark button to access Help directly from the Orders Import/Update form accessible from the Import from Spreadsheet button. Entries > Packing Slips - NEW - Module added for packing slip management and printing. Users can create packing slip items from scratch, or items may be submitted for use on Packing Slips from WO > Details (component info), WO > Equip, WO > Parts, WO > Other, Invoices > Parts/Equip/Misc, P&Es > Order Items and P&Es > Receive Items. Reporting functions also available. Detailed instructions can be found in the Packing Slips chapter of the Help files. Or you can use the yellow question mark button to access Help directly from the Packings Slips > Main page. 8130s > Main - NEW - When Admin > Global Config > General > 2 Miscellaneous > General 1 > General Country of Usage is set to Canadian, a second print button is available for the Transport Canada Form One; in landscape format, front and back. Invoices > Main > Print > 6 Packing Slip - NEW - Basic packing slip printout available. Similar to current invoice printout. P&Es > Main > GST and PST Tax fields - NEW - When Admin > Global Config > General > 2 Miscellaneous > General 1 > General Country of Usage is set to Canadian, users will have an additional option in Admin > Global Config > General > 2 Miscellaneous > General 1 to turn on "Use GST and PST". If turned on, GST and PST will show on P&E screens, printouts, Monthly and Annual Totals and Monthly Taxes (Purchases) screens and reports. P&Es > Text/Other > Customer Code - NEW - Customer Code quickfill or italic picklist available to populate the Ship To fields with the Databases > Customers > Other > Shipping Information. MCFs - NEW - Block 13a Remarks default text now editable. See new Block 13a default text in Admin > Global Config > Documents > 8130s and MCFs. 8130s - NEW - Block 13 Remarks now allows default text for all new 8130s (not created from a Template). See new Block 13 default text in Admin > Global Config > Documents > 8130s and MCFs. User will now have options when Update from WO to replace block 13, insert text at beginning or insert text at the end. Reports > Inventory > 1 > Main > Export - Modified - users are now warned when trying to export data with the "Include Part # Subtotals" option turned on. Exports completed with this option turned on can skew List and Cost values for the exported report as each subtotal entry becomes a line/row in the export file. Entries > P&Es > Main - Fixed - problem from 6.50Y_009 only that was not updating/refreshing the P & E Total field if users click the italic Actual Amount or Shipping labels to populate the fields. Entries > Quick Parts > Add Serial - Fixed - problem where serial items were not respecting repair cost values from Inventory. 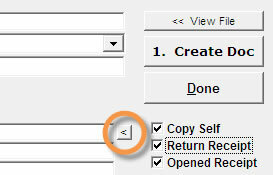 Entries > P&Es - New - users now allowed to enter multiple invoices per P&E by clicking the italic "Seller Invoice #" label. AVM Startup - Fixed - "Alias is not found" error that would occur when Inventory Batches were turned off and the Inventory Shelf Expiration warning function was turned on. 8130's > Main > Qty - Improved - increased the number of digits allowed from 3 to 4 to allow quantities of up to 9,999. Printouts modified to allow up to 4 digits as well. Admin > Global Config > Inventory > 1 General > Main > Use ITAR functions - new configuration choice allows users to store ECCN (Export Control Classification Number) and/or Sched B information for Inventory items for ITAR compliance, using Inventory, P&Es, Work Orders and Invoices. NOTE: These fields only print on the Invoices > Main > Print > #1 Customer Invoice. 8130s > Print > 1, 2, and 4 - Fixed - problem where printouts were printing WO Ref # field for Block 5 instead of the "5. WO/Ctrct/Invoice field"
Entries > P & E's > Receive - NEW -UserID field added to track who/when a line item was received in. This is stored independently of any user info that may be saved in the Inventory History or WO files. Invoices > Print > 1 - Fixed - when Electronic Signatures in use - and a signature was assigned to an invoice, but the RTS was not selected to print, the signature would still print without an RTS. Fixed W & B > Main > Print > Large - Fixed - Previous data text ran into Previous load text. Log Book Stickers > Main > Load Fresh Data > From Aircraft Record - Improved - will now pull TACH time from Left/Single Engine data in Aircraft Record. If blank, it will try to pull from Right Engine. If both are blank in Aircraft Record, users can manually populate TACH in the Log Book Sticker. RO's > Receive > Receive Item into Inventory - Fixed - problem where under certain circumstances, if a record for an item already existed in Inventory, and the user selected for the item to be received/updated into Inventory, the line item cost was put into the Serial Cost and Repair Cost fields, effectively doubling the cost of the item. Users will now get a message showing exactly how the inventory item as updated. WO > Details > Update Inventory - Improved - made modifications to this function to add the repair costs of an item to any existing repair cost in the Inventory record for existing items. Previous behavior completely replaced the repair cost value, effectively reducing the cost of the item. Users will now get a message showing exactly how the inventory item as updated.